Rain boots are perfect for staying dry but they are not known for keeping feet warm. Rain boot liners are the perfect solution to keep feet warm and cozy while they remain dry in rain boots. 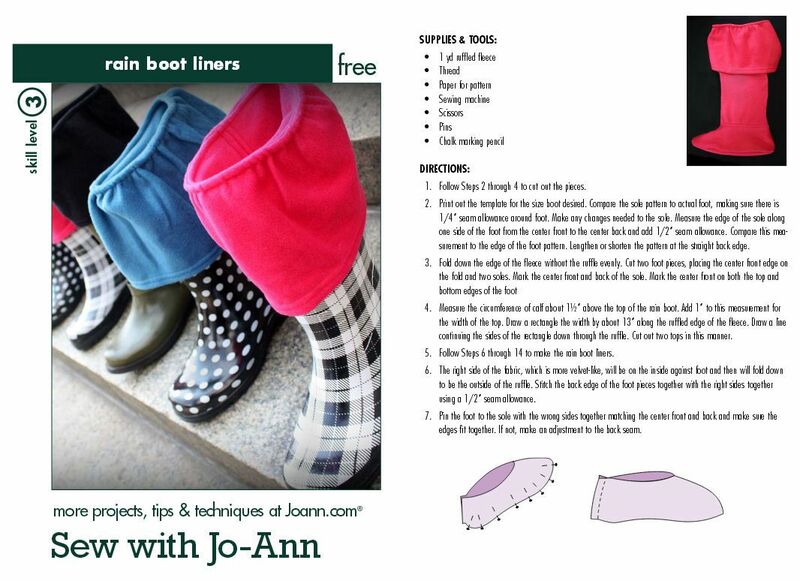 These free boot liner tutorials and patterns may eliminate any arguments from the kids or hesitation from adults about wearing uncomfortable rain boots since the liners will make feet warm and cozy. This PDF pattern and full directions creates a boot liner in sizes seven through ten with a ruffle or gathered top to decorate the top of the boot. Since the ruffle is a separate piece, the possibilities are endless. I can't think of any little girl that I've ever met who wouldn't love having these to add to her, jump-in-the-puddle boots. The pretty flowers may actually stop her from jumping in puddles so that the flowers stay clean and pretty. The simple instructions can be applied to any boot liner desired. These great boot liners combine fleece fabric and a fabric for the top of the boot liner. In the example a plaid scarf was used, so you could make them to match mittens, hats, and scarves. The instructions elaborate on a free slipper pattern to create boot liners. This downloadable free pattern includes children's sizes 7/8 and 11/12. These are embellished with adorable puppy eyes, ears and nose. Boys and girls alike are bound to love these. Consider making extras for winter boots so their feet stay warm and toasty even in the coldest weather. The instructions are wonderful for learning to use your serger for overlocking or faux overlocking options with your sewing machine to sew fleece socks. This free tutorial will transform those twenty dollar rain boots into something more fashionable and much warmer once you have fleece liners. The writer explains in detail how to draft your own pattern with room for the arch of your foot. This purchasable pattern makes rain boot liners so they are as warm as a winter boot. The PDF pattern from youcanmakethis.com includes toddler size seven to Youth size seven. Women or Kids Boot Liner. This pattern is not free but is very reasonably priced for a PDF pattern that includes 21 sizes. A discount is also offered for liking them on facebook. This pattern is worth taking a look at if you want to avoid drawing a pattern.